Oh yes, it really is 6:49 in the morning! I'm waiting for the day when your drawings won't make me gasp in awe and utter the overused, "wow". I don't think it's ever going to happen! The bookmark looks like a scene from Mary Poppins. Enchanting. Love, love, love your drawings. Many people go to pubs and go home with others, hangovers, memory loss, less money...but you go home with magical little treasures. So cool! Ughh, I love city scapes. My heart has been caught. I love the bookmark too. Is it a fantasy location or a real one? It looks kind of Russian. 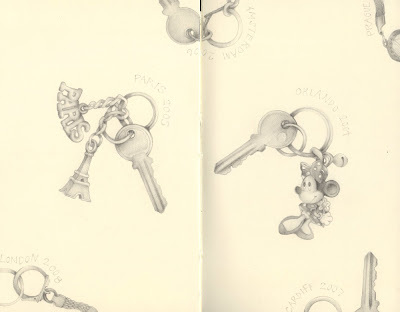 The keyring drawing would make great giftwrap. you continue to amaze me, love the bookmark! 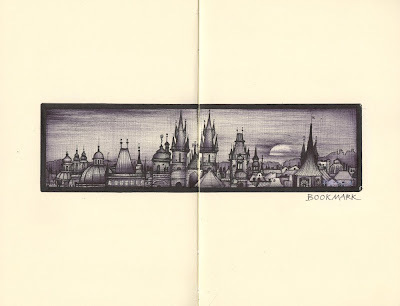 Fantastic- I love Prague, and this drawing captures it so well! OMG, what I wouldn't do with your tupperwear collection ... Did some one give it to you, or do you live by the seaside? The bookmark is brilliant and loved the keys and charming key rings. Like always, the whole post is a treat for the eyes. Hi Andrea - just catching up with your work - sorry not to have visited for so long. Your bookmark is striking and should surely be reserved for only books of the highest literary quality! Ahhhhmazing. I hope a trip to North Carolina could end up in that travel moley. Andrea, I want to pop out to the pub with you! Sounds like a good time-and some good finds! Stepehen, 6:49. That's just wrong. The last time I saw that time of the morning is when I've been up drawing all night. Or singing and dancing to Crosby Stills and nash, in my living room. But, that's another story, and probably one I shouldn't be admitting too. Donna, I had the hangover too. In the past I've also left the pub with an electric sewing machine! I don't know how, but it happened. Doris, you'll see more soon.Very soon. Kay, it's a bookmark from Prague. So you were close. Yeah, I think it would make good gift wrap or wallpaper or fabric. I'd love to continue the theme with keyrings from around the world. Mithi, I was loaned the seaside goodies. For drawing, of course. Love your keys! Suzann, i hope so too. Hope I answered all the qusetions there. Thanks a lot, guys. I'm going to be boring you with more of this Moley over the next couple of weeks. I'm just warning you. This has to be the longest comment EVER. hello andrea ¿ how is your spanish? and your visit to London for the editorial? The bookmark is absolutely gorgeous!! I love it!